What is Your Company’s Prospecting Culture? Quit blaming salespeople for bad prospecting habits when you the sales manager have prospecting habits that are just as bad! Culture starts at the top, and if you want your team focused on prospecting, you too must make it a priority. Your role as a sales manager/leader is not to be the best prospecting person. Your job is to coach and support the job your people do when it comes to prospecting. Each time you focus the attention of sales team to tending to petty issues with existing accounts rather than prospecting you’re defeating yourself. Prospecting is not something people wake up in the morning and get excited about doing. Sure, there are a few, but don’t kid yourself into thinking you’ve hired all of them! Dreamforce is next week and I’m pleased again to be speaking at the Sales Summit, Tuesday, Oct. 4, at the Marriott Marquis. Don’t delay in signing up for my session at this link. During my session I’m going to be hitting this issue hard for one simple reason — too many companies are missing their plan because of a failure to properly prospect. Two very quick things you as a sales manager can do everyday is to be asking your salespeople: 1. What new insight did you learn today from a prospect you connected with? 2. Who is on your list to prospect tomorrow and what’s your plan with them? If each sales manager were to ask their salespeople those two questions everyday and still not do anything else the results would improve dramatically. Prospecting is not an afterthought it must be a “primary thought” something your team with the same commitment as they take towards taking a shower each day. Join me at Dreamforce! Let’s connect and let’s discuss more quick ideas to help prospect better. 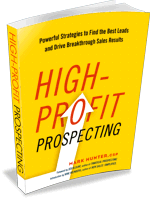 By the way, if you have not picked up a copy of my newest book, High-Profit Prospecting, you need to, and while you’re at it, grab copies for each member of your team. I’ve got a special offer for your team! Check it out at this link.